After Poland joined the EU, house prices more than doubled from 2004 to 2007, then fell back significantly in 2008 and 2009 but only around 10% to 15% off their peak, at present few observers expect a correction to pre-boom price levels and recent reports from Q2 2010 suggest the market has stabilised. Growth in demand has been soaking up new supply. Poland was the only major country in Europe to avoid recesion, according to GDP figures the economy grew by 1.8% last year and has continued to expand this year which in turn has helped to revive the housing market. There is still a huge disparity in property prices between the UK and Poland, at the time of writing, you can expect to pay around £120,000 for a modest two bedroom flat in a provincial town in central England, a similar property in Poland will set you back just half that amount. If house prices across Europe are in a process of convergence then we can expect a property investment in Poland to bring a good return in future. We will be reviewing the buy to let market and property yields soon. Of course regional factors and the quality of the housing will vary considerably in different regions and within regions at select locations, canny property investors will know that whatever the general market fluctuations, money can be made by finding the right property at the right price, buying low and then selling high. RICS European Housing Review 2010 from the Royal Institution of Chartered Surveyors produces excellent reports covering details of the housing market across the European Union including Poland. 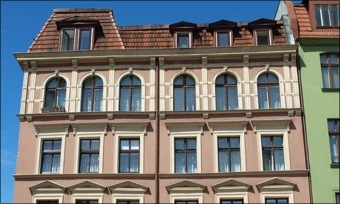 REAS report on the Residential Market in Poland 06.2010. REAS is expert advisor in the field of housing projects planning and development in Poland.